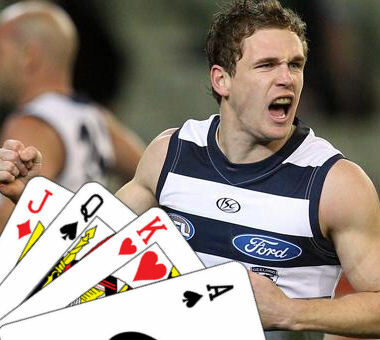 JimBob looks at the biggest gun from the cattery in Joel Selwood. Can he continue the second half form of 2013 and jump above 110ppg? Or will his little brother beat him again? Joel Selwood is Mr Dependable. He is the safe bet of Dream Team, the money in the bank which you know will make you interest. He is a ‘set and forget’ midfielder in 2014. After being held to a very Adam Selwood like 38 by Crowley in round 14, Joel responded with – 128, 126, 133, 136, 98, 157 135 and 110 for an 8 round average of 127. That’s super-uber-elite scoring right there. Was this a purple patch or a sign of things to come? Looking at the stats for Joel over the past 5 years, they make for some very pretty reading. Hes averaged a 100 points or more per game every season. He’s averaged 4 Marks a game or better in 4 out of 5 seasons. In his last 3 years, he has kept his kick:handball ratio at 1:1 or better. In the 101 games he has played, he’s tonned up in 60 of them and got 90+ in 72 of them. He averaged almost 1 hit-out per game. And this is a 25 year old player who is about to hit his prime. Just think about that for a second. We may not of seen the best of this superstar. While everyone remembers that Joel had a cracking 2nd half of 2013, people may not realise that he had a poor first half of the season. From rounds 5 to 10, he only scored one hundred in 6 weeks. He hasn’t done that in 5 plus years. What naturally comes of being in the elite bracket of midfielders in the AFL, is the attention from the best opposition’s stopper and Selwood is right near the top of the tree, and scores of 38 can happen. It is always the worry of a DT coach of this attention and a restricted score, but something of a normal day at the office in Jelwood’s diary which he has had for quite some years. What is also worrying is the info that came out this week that Jelwood is in a moon boot after having foot surgery last week. He says that he will be fine for round one, which is a given going on his durability, but will he be 100%?. I don’t know. And now to sound like a broken record. Value. Value everywhere in the mids. Probably the only way to consider Jelwood is if you choose to go a 6-7 premo mid and look for other value in other lines. And like Shaun Marsh, Jelwood is also not the highest averaging player in his family in the most recent season. KING/ACE – Jelwood will likely go under the radar at the start of the season but be in every team by season end. Jelwood will be more suited to start in RDT due to his consistency as a keeper and be someone everyone will jump on in classic once he has a hot streak. Still a few questions to be answered in regards to his injury and if he will be the best selwood in 2014, but his big scores and captain potential can’t be ignored. nice jimmy jim bob, do you think the new ducking tackle rule will impact his free kicks f and a ratio, might get him a little frustrated…. still he gets loads of the ball and could probably improve goals per game as well… bench him when he plays crowley??? does anyone know why i cant register for dream team? when im getting to the last page and click “register” it just doesnt do anything…anyone else get this? Yea I am getting the same thing. I just figure I will wait a week or 2 for all the DT plebs to log their teams before I really start worrying about it. As for Jelwood, upgrade target for me. Was going to start with him but injury interupted preseasons are no good for anyone. Hit up http://www.fanhubmedia.com/contact-us/ for service. Even though there have been a few teething problems, they’ve provided great customer service. — Upgrade target post bye!! Perfect strategy! My thinking too. Can somebody tell me when dreamteam opens please?